River, rail and interstate are the makers of industry, giving rise to opportunity and American optimism. The goal of the Cairo Economic Development committee is to match Cairo's assets to businesses ready for a proverbial re-fuel. 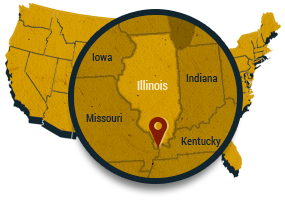 As a committee and as a greater community, the people of Cairo, Illinois, ask you to dig deep into the incentives, infrastructure, available properties and success stories of companies rediscovering Cairo. The storied river town at the confluence of the Mississippi and Ohio feeds into the nation's primary shipping routes with three rail lines and highway/interstate access. Yet this unrivaled commercial potential is comparably untapped, holding a space for the new heroes of innovation and job creation. To see how Cairo is already advancing business enterprises, click over to Testimonials. Demolition and cleanup of many sites around the area is in progress. Many have been completed already, but more are still on the way. New property listings are becoming available regularly. Check our listings to see what parcels are available. Local industry leaders believe that Cairo is a great place for business. Read what they have to say about why this area has so much to offer. Plans are underway to give a major upgrade to one of the primary routes into and out of Cairo. Big things are happening in Cairo!